February 2019 Newsletter: CT’s Complete Count Committee Announced, the Census is Hiring, Data Storytelling Rescheduled, and We Want Your Feedback! Follow us on Twitter and Facebook for the latest CTData news and events! The new year is always a great opportunity for a fresh start, so we decided it was time for a makeover. 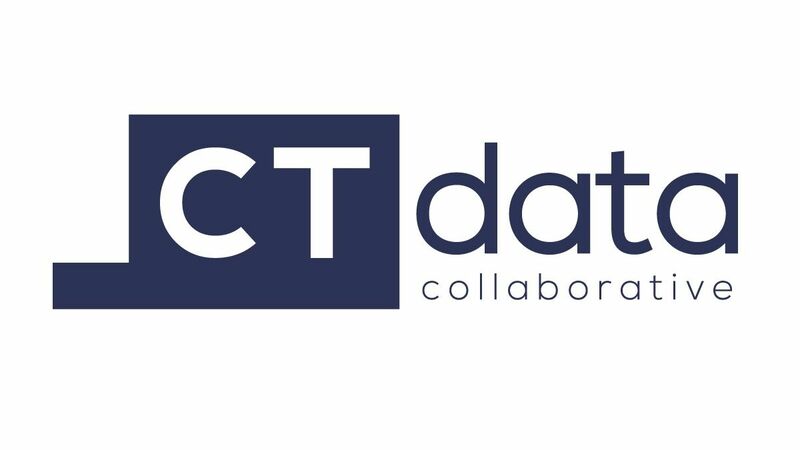 Check out the Connecticut Data Collaborative’s new logo above! Lieutenant Governor Susan Bysiewicz (center) announced Connecticut’s Complete Count Committee at the State Capitol on Monday. 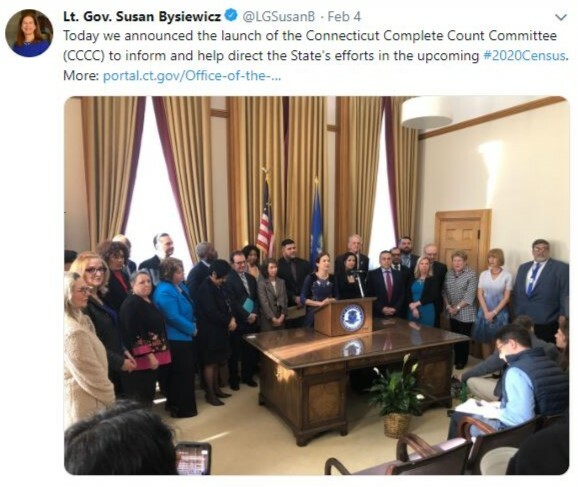 Connecticut Data Collaborative’s Michelle Riordan-Nold (directly left of Bysiewicz) will participate in the committee. 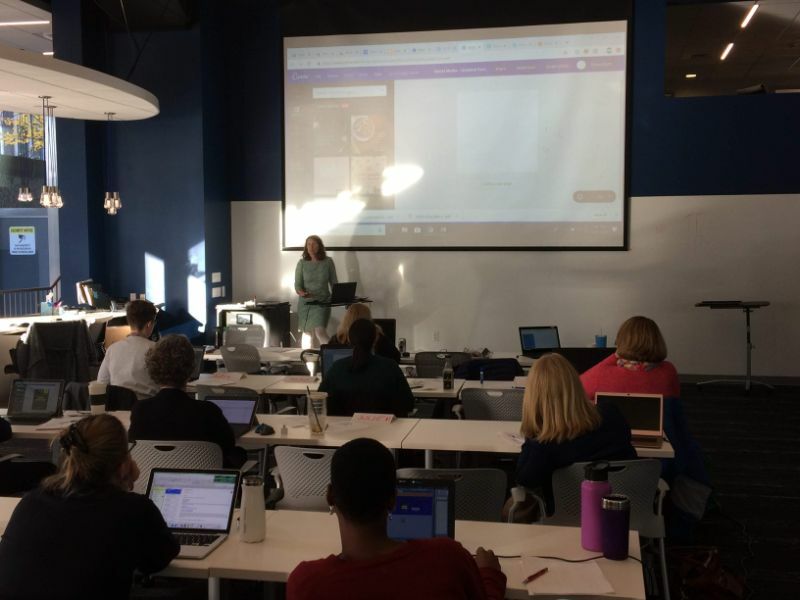 We have some exciting news: Connecticut’s Lieutenant Governor Susan Bysiewicz has formed a Complete Count Committee for the state, and Connecticut Data Collaborative’s Executive Director Michelle Riordan-Nold will serve as a member! Lt. Governor Bysiewicz made the announcement on Monday at the State Capitol. She will chair the committee and has selected Secretary of the State Denise Merrill, State Representative Christopher Rosario of Bridgeport, and State Representative Pat Wilson Pheanious of Ashford as co-chairs. Why become a census taker? Census data affects the flow of around eight billion federal dollars into our state. The more accurate the count, the better chance that important programs like Medicaid, special education, and the Children’s Health Insurance Program will be sufficiently funded to meet the needs of our residents. Census data also determines our representation in Congress and serves as the foundation for decisions made by businesses, local governments, nonprofits, human services providers, and residents. Pictured above is our assistant director, Rachel Leventhal-Weiner, who will be leading our rescheduled Data Storytelling workshops on 2/8 and 2/12. Rachel will share what she’s learned from Tapestry, a conference dedicated to digital data storytelling, as well as her own strategies. There are still spots left in both sessions! February 8th and February 12th: Data Storytelling rescheduled in Hartford, 10:00 am-12:00 pm. Fee is $25. In this workshop, we bring together best practices in data reporting and data visualization, as we guide participants through several exercises to learn how to create effective data stories. Participants will benefit most if they have engaged with our introductory workshop, Data Basics. We ask that participants bring their own laptops to be able to practice and engage in some of the activities. How Can We Improve Our Services for You? Did you participate in any of our workshops or calls in 2018? If so, we’d like to hear your feedback and suggestions, what you found helpful, and what ideas you’d have to make our events more useful. Please take 5-10 minutes and complete this survey to share your perspective with us! February just started, but we already have a head start on updating datasets! See below for a list of what we’ve added. Copyright © 2019 CT Data Collaborative, All rights reserved.